I passed by a new Dollar Tree so I thought I’d check it out. I had visited the 99 Cents Only Store a while ago, and wanted to see if there were items I could pick up to add to the stockpile. I took photos of various items that caught my eye. Spring water was going for $1 per gallon, which is cheaper than our supermarket, where a gallon is going for $1.25. 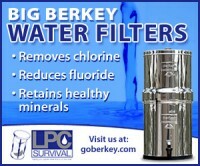 I run tap water through the Berkey and fill up empty soda bottles, but if you are just starting out you need to build a stockpile of water. Picking up a couple of gallons of bottled water a week until you have at few days worth of water to start is a good idea. The canned goods were on sale at $0.79. 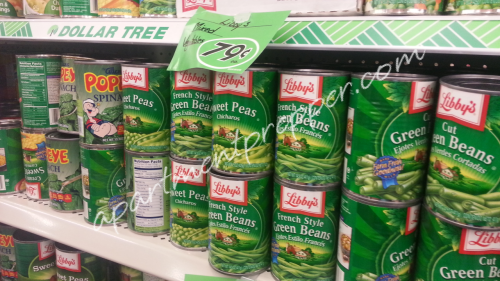 They had a good selection of canned corn, mixed vegetables, green beans, peas etc. I normally see them around $1.25 on sale at the supermarket. Don’t forget to check the expiration dates, and buy only the ones your family will eat. 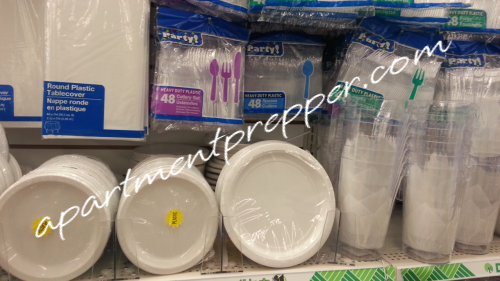 Paper plates, plastic utensils and cups can come in handy during an emergency when you have no water to wash dishes. They are also good to have for “everyday emergencies” such as a last minute party at the school or a potluck at work. These are not a bad deal for a dollar a pack. As for toilet paper, I thought you can get a better deal at discount stores such as Walmart or Target, or even the supermarket when they go on sale. I thought the best deals were on personal care. 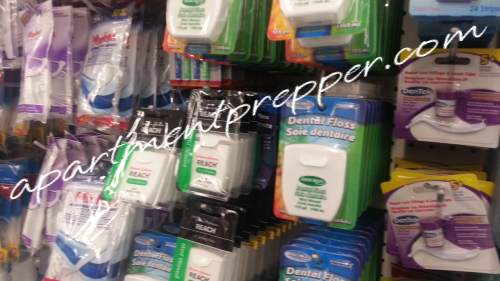 Floss (55 yds) for $1.00 is a good price – I saw the same one at the pharmacy for $1.79. The cotton swabs were also a good. I wouldn’t recommend the pain relievers, the ones I saw were close to expiration: February 2014 is much too close. They had some nylon rope, which is good to have, but is usually overlooked. At the last hurricane we used one to secure a tree branch to keep it from falling over. 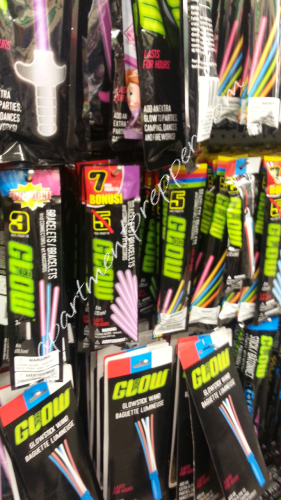 Glow sticks are also good to keep at a handy location during a sudden power outage. 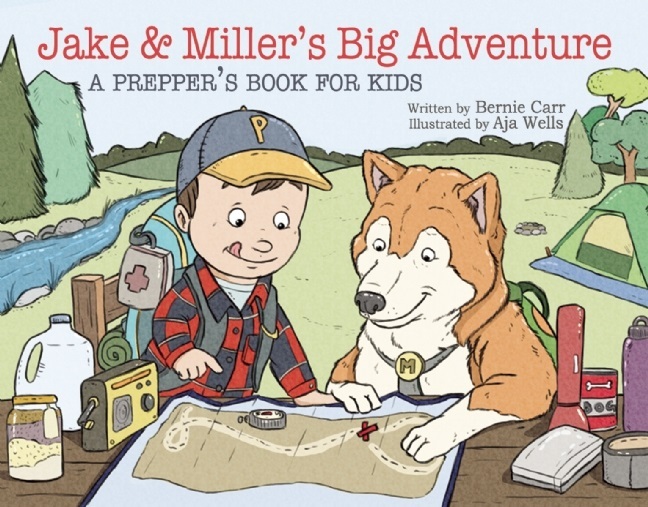 They last a few hours, and are entertaining for kids. 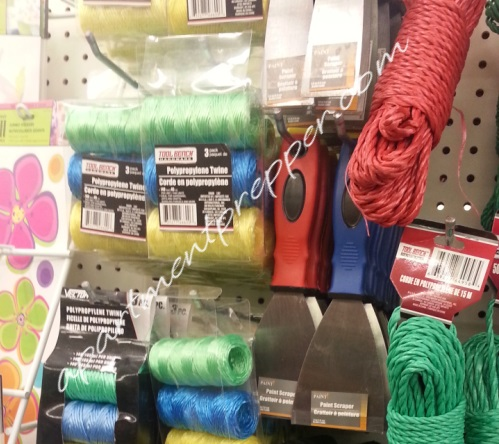 Sponges and steel wool were also in abundance, so I picked up a few. I also spotted safety pins, clothes pins (in case you have to hang laundry out to dry), mini sewing kits – items that I usually forget to pick up at larger stores, but know I will need. I believe that anyone can slowly build a stockpile, even with just $5 a week, as long as it’s done consistently. Not everything is a great deal at the dollar store, but as long as you keep track of pricing and always check expiration dates, it is a worthwhile place to check for prepping supplies. Hi Bernie, love this! We have been doing this for years. Did the food in the past but since finding out about GMO, won’t do anymore. Now, I have lots to catch up on with food as I don’t want GMO. Thanks for sharing . Hi Clarissa, I was pleased at all the non-food stuff that was available for $1. I may check it regularly now. Thanks for the comment! Hey Kent, that is wise advise – it’s not a bargain if it breaks! Your spatula story reminded me where I got mine – at the Goodwill! It is my favorite cooking utensil. Thanks for sharing your experience. Great ideas. I watch price/ quantity and continue to read labels . I never buy POLAR brand as it is Chinese…as well as many other brands. Their quality control is highly questionable, and I will not put Chinese branded products in my store house. I am highly suspect of food stuffs from Mexico and other countries. I recently read an article concerning Mexico based Hot Sauces…lacking in quality. I contacted the makers who stated they have received complaints that are being dealt with. QUALITY control is what it is all about. Hi Charlie Max, I favor the “made in the US” brands as well, so in addition to watching pricing, reading labels is key. Thanks for the comment. If you have an Aldi’s, they beat these canned good prices by a mile. Where do you live that you pay 1.25 for a can of vegetables? .45 cents to .59 cents mostly here. Leave those clothespins on the shelf. From experience, you want Ace Hardware pins for those clotheslines, folks. Jay Jay, No, we don’t have an Aldi’s nearby, I hear they have good prices. I always remind everyone to be aware of the going rate and compare prices before making a purchase anywhere. Good to know about Ace Hardware clothespins. Thanks. Be careful to compare unit prices, not package prices. I was in Dollar Tree yesterday and then went across the street to COSTCO. In DT, a roll of standard aluminum foil is 1$ for 18 feet (12 inch width). Costco sold ( in a bundle of two rolls) 40 times as much for $23. There may be good reason to get the smaller amount but the valid comparison is by unit price. Great article. 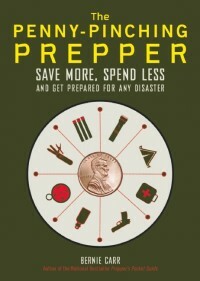 These are some usual stuff for survival especially during heavy storms and hurricanes. A pretty good collection of simple but very useful stuff. Best to stock these stuff up at home too. I love the Dollar Store. I pick up the Chicago Tribune for $1.00 every Saturday. In addition they have 6 bottles of water for a dollar. This beats paying $1.48 per bottle. In addition I love the seasonal items and the bags for Christmas. Were else could someone get the huge shopping bags for a dollar? Excellent post! Very useful article. I always check the dollar store before I go anywhere else.